Karachi: British boxer Amir Khan on Wednesday hailed the decision to allow professional boxers at the upcoming Olympic Games in Rio de Janeiro, saying he would love to represent the country of his parents’ birth Pakistan. Khan, born and raised in Bolton, England, won a silver medal in the lightweight category of the 2004 Athens Olympics before turning professional a year later. But Wednesday’s ruling by boxing’s governing body at an extraordinary congress in Lausanne, Switzerland that professional boxers can compete at the upcoming Olympic Games in Brazil, rekindled Amir’s dreams of glory. His father Sajjad Khan hails from Matore village near Kahuta, home to Pakistan’s nuclear facilities and close to the capital Islamabad. He migrated to Britain, where Khan was born in 1986. Khan said he has roots in Pakistan and wants to serve the country. “I will be very happy if I can compete in Olympics. 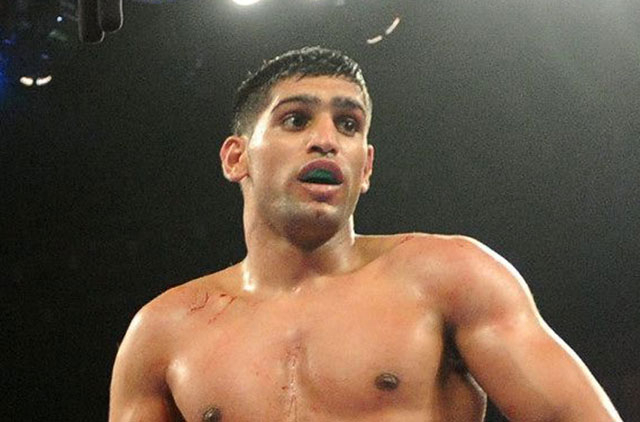 I want to serve Pakistan,” said Khan, who has been scouting boxing talent in the country for the last few years. But Khan’s younger brother Haroon’s dreams of representing Pakistan in the 2012 London Olympics after being snubbed at home were blocked by boxing’s governing body AIBA as he had represented Great Britain at junior level. Haroon had represented Pakistan in the 2010 Commonwealth Games in Delhi, India where he won a bronze medal in flyweight event. Seven Pakistani boxers will compete in the last qualifying rounds in Baku, Azerbaijan, but they stand little chance of reaching the Rio Games. Pakistan’s last appearance in the boxing event came at the Athens Games in 2004. Pakistan Boxing Federation secretary Iqbal Hussain said he was thrilled at the prospect of Amir representing the country. “I have to check the rules whether Amir can compete or not but it would be a huge boost for us if it happens because he is our hero,” Hussain said.